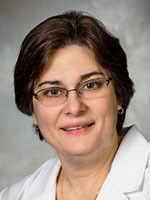 Dr. Maria Petrillo-Bolanos is an experienced Emergency Medicine physician. She earned her medical degree from Boston University School of Medicine and also holds a Master of Arts in Medical Sciences from Boston University. She completed an Emergency Medicine Residency at St. Vincent Medical Center and the Toledo Hospital in Toledo, Ohio, where she also served as a Flight Physician with St. Vincent/MCH Lifeflight. Board certified in Emergency Medicine, Dr. Petrillo-Bolanos is a member of the American College of Emergency Physicians and the Emergency Medicine Residents Association. She is fluent in Spanish and Italian.